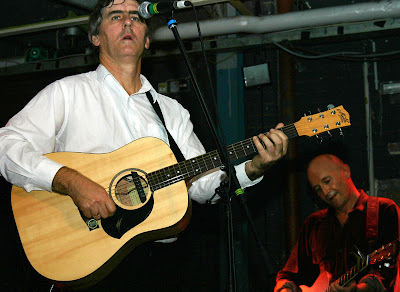 Today's ROBERT FORSTER is the former co-leader of the underrated GO-BETWEENS, not the actor from the underrated "Jackie Brown." Forster's musical cohort, GRANT McLENNAN, died in May of 2006, thus putting an end to that '80s and '00s enterprise (both men spent the '90s as solo artists). [MP3] "Did She Overtake You"
Thanks for posting this. "Calling You" by the Go-Betweens is an incredible song. I have a band I think you'll dig. Is there an email address where I can send you an mp3?